It's a simple story really - boy meets horse, boy loses horse, boy finds horse again. 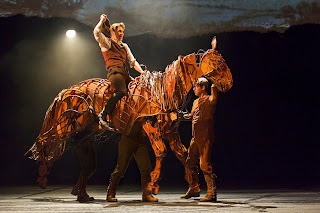 But the hit play War Horse (which opened on London's West End in 2009 and won the 2011 Tony on Broadway, where it's still playing) is more than just this simple love story, and the moving story of the devastation of war. The true stars of this show are the massive life-size and life-like puppet horses. I'm not really interested in spectacle at the theater (think the chandelier in Phantom or the helicopter in Miss Saigon), but this is different. This is true artistry, both in the creation of the puppets and the manipulation of them by the puppeteers. It's really a perfect example of art meets technology. These horses are magnificent creatures and seem to have emotions, thoughts, and a soul as much as real animals do. They're effectively used to tell a beautiful story, but the reason to see this play (the Broadway Tour is stopping at the Orpheum through June 23) is for this incredible puppet show, unlike any you've seen. The play is based on the children's novel of the same name, as is the 2011 movie (which I've just recently seen - there are slight differences in plot and character, although the overall story is the same). It tells the story of a boy named Albert whose father recklessly buys a thoroughbred horse, of little use on the family farm. Albert falls in love with Joey, as the horse is called, as he trains him to earn his keep on the farm. Then the Great War happens, and Albert's father sells Joey to the English cavalry. Albert is devastated, and soon follows Joey into the war despite being a few years too young for service. Both Joey and Albert see much death and destruction in the trenches of World War I France, but both also experience friendship with people they meet along the way. Boy and horse are eventually reunited, forever changed by their wartime experiences, and if you don't tear up at least a little bit at that moment, well, you've probably never loved an animal or felt their unconditional love in return. Despite being overshadowed by the horses, the humans are pretty good too. Alex Morf (an Olie!) 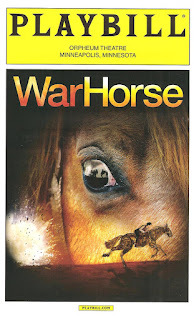 plays Albert and gives him much depth and warmth, with a genuine feeling of love for his horse. The charming Andrew May, as German Captain Friedrich Müller, shows us that the guys on the other side can be sympathetic too. He makes friends with a lonely French girl who reminds him of his daughter, played with spirit by Lavita Shaurice. Another lovely feature of the play is the use of music. Ensemble members John Milosich as "song man (vocal)" and Nathan Koci as "song man (instrumental)" provide musical accompaniment to the action, singing period war songs, sometimes accompanied by the cast in beautiful and haunting harmony. 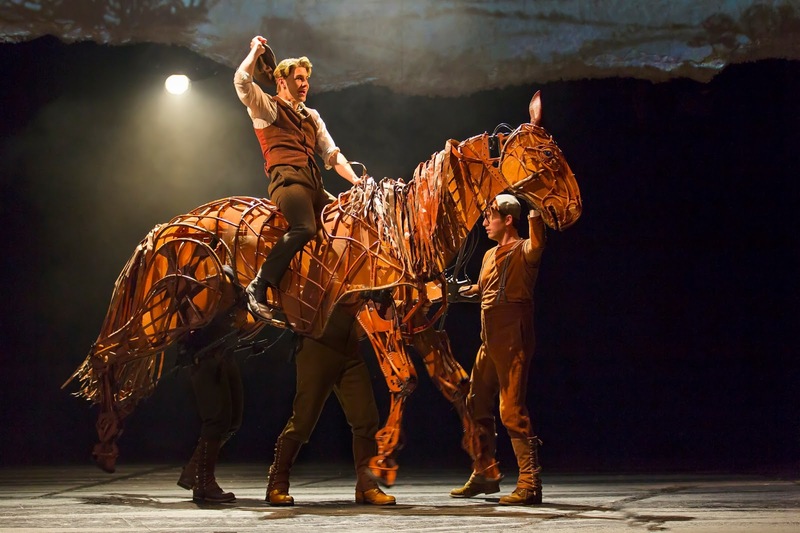 The artistry and engineering on display in War Horse are really something to see. 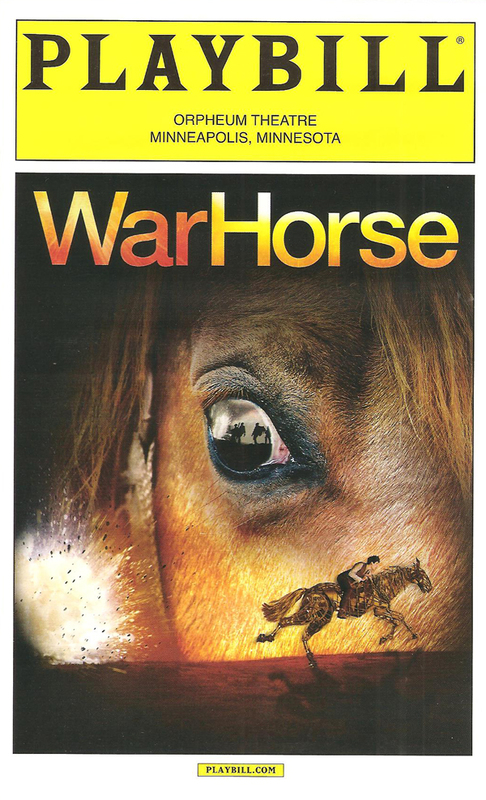 The play felt a little long to me (maybe because I was tired and they started late on opening night), but it's a beautiful and moving story about love and friendship (both human and animal), war and death. And the horses - wow.